Ylva Martens, Swedish radio producer, speaks of children’s programming as Fojo’s Jim Downing looks on. LBC-TV senior correspondent Tania Mehanna (standing) speaks on media coverage of wars and impact on children. Journalist, filmaker and international project coordinator for the Swedish Institute for Further Education of Journalists (Fojo) Jim Downing and Johanna Hallin, web editor of Children’s World. Abu-Fadil presents paper on “Media Literacy” at Alexandria seminar. 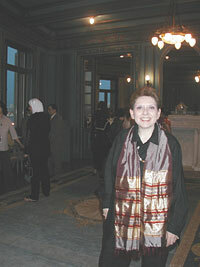 IPJ director Magda Abu-Fadil at the Swedish Institute in Alexandria. Tomorrow’s leaders are often overlooked by the media and much needs to be done to rectify the matter, but all is not lost, participants at a seminar were told. 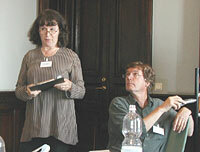 Experts from print, broadcast and online organizations met with academics and members of NGOs to discuss “Young People and the Media” at the Swedish Institute in Alexandria, Egypt, May 25-27, 2004. Children are major media consumers, but what tools and knowledge do media equip youth with to understand and deal with the world in which they are growing up? The United Nations Convention on the Rights of the Child clearly states that children have the right to communicate, participate and be informed. Ratified by 192 countries, the principles set forth in the CRC can be summarized in what has become known as “the three Ps:” protection, provision and participation. The portrayal of children and young people in the media. Young people as media consumers. Young people as producers of media. Seminar recommendations included promoting awareness campaigns in schools, teaching children how to understand and deal with the media; creating exchange programs for European and Arab young people; creating networks of journalists and youth; creating youth TV channels (with young people involved in production); initiating an international training program for young people; organizing journalism workshops for young people; and, planning workshops about youth for journalists and NGOs. The Swedish Institute and the Swedish International Development Agency are following up on the seminar by exploring funding opportunities and partnerships with various organizations in a bid to further the cause of young people.